Huge Savings Item! Save 15% on the Straight Brass Bulb Horn by Folkroots at Bass Brass. Hurry! Limited time offer. Offer valid only while supplies last. EXCELLENT FOR MUSICAL WASHBOARDS, VINTAGE CARS, CLOWNS & ENTERTAINERS. Straight brass horn features small bell inspired by ancient trumpet design. EXCELLENT FOR MUSICAL WASHBOARDS, VINTAGE CARS, CLOWNS & ENTERTAINERS. Straight brass horn features small bell inspired by ancient trumpet design. Similar to King Tut's silver trumpet. The oldest surviving examples of metallic trumpets were discovered in the tomb of Tutankhamun in 1922. Our Straight Brass Bulb Horn is about the size and shape of Tutankhamun's silver trumpet. REPRODUCTION ANTIQUE-STYLE BULB HORN: This instrument is handcrafted yet budget-priced. It resembles vintage bulb horns your great-grandad might have seen on early motorcars from 1900 to 1915. 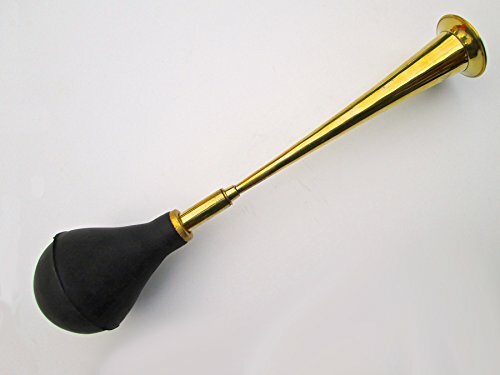 The horn measures 17" (43.18 cm) in length and features a small 2-1/2" (6.35cm) diameter bell, removable brass or plastic/metal reed, and rubber squeeze bulb. ATTRACTIVE BRASS FINISH: Made from real brass that achieves an attractive antique patina with age. Or keep finish shiny with any commercial brass polish. WHY CHOOSE THIS HORN: If you want a budget-priced, antique-style, light-weight, straight brass bulb horn that's perfect for motor cars, swanky ceremonies and royal processions, then this horn is for you. LOW-COST REPRODUCTION: Vintage design at a budget price. LIGHT-WEIGHT PRACTICAL CONSTRUCTION: Easy to carry, won't wear you down. Removable reed and bulb. FREE 4-PAGE BULB HORN TIPS GUIDE packed with each shipment. HAND APPLIED PROTECTANT guards against ozone, oxidation and UV radiation - extends life of rubber. CERTIFIED INSPECTION: Authentic Folkroots bulb horn products include official inspection certificate verifying item was bench tested, passed, and guaranteed by Bone Dry Musical Instrument Co. SATISFACTION GUARANTEED: Want different tone? Includes coupon for free replacement reed. If you have any questions about this product by Folkroots, contact us by completing and submitting the form below. If you are looking for a specif part number, please include it with your message.